Caratteristiche: Colore rosso rubino intenso con riflessi granati. Il profumo è ampio e complesso con mature sensazioni di ciliegia, frutta a bacca rossa, note di tabacco e piacevoli sentori di caffè e cacao. La struttura è complessa e l'equilibrio tra i morbidi tannini, l'acidità ed il frutto si uniscono ad un finale molto persistente. 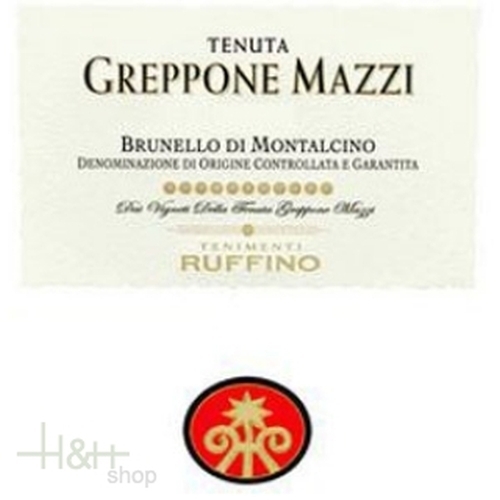 "Doctorwine" has rated the wine "Ruffino Greppone Mazzi, Brunello di Montalcino DOCG, Italy" the vintage 2008 on 17.04.2015 with 89 of 100 points.
" Made 100% Sangiovese Grosso grapes, the wine ages in large oak barrels of 36 months. It has a transparent ruby color and an aroma that is smoked and balsamic, rich in notes of spice and red cherry. The mouthfeel is agile, lithe and fruity with polished tannins, a nice acidity and a long and tasty finish. " "Decanter World Wine Awards" has rated the wine "Ruffino Greppone Mazzi, Brunello di Montalcino DOCG, Italy" the vintage 2012 on 01.01.2017 with 83 of 100 points. "Wine Enthusiast" has rated the wine "Ruffino Greppone Mazzi, Brunello di Montalcino DOCG, Italy" the vintage 2011 on 05.01.2016 with 93 of 100 points. "Wine Spectator" has rated the wine "Ruffino Greppone Mazzi, Brunello di Montalcino DOCG, Italy" the vintage 2010 on 30.06.2015 with 93 of 100 points. 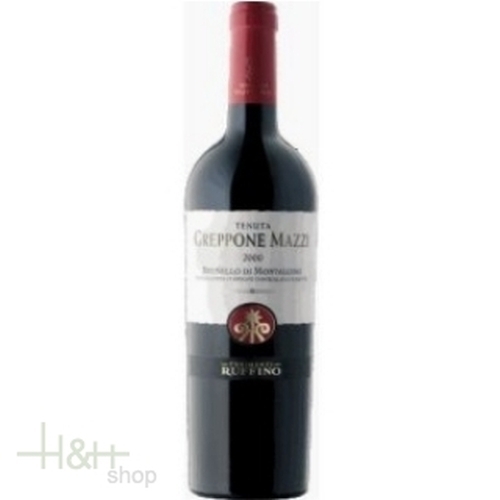 "Wine Enthusiast" has rated the wine "Ruffino Greppone Mazzi, Brunello di Montalcino DOCG, Italy" the vintage 2010 on 05.01.2015 with 90 of 100 points. "Wine Enthusiast" has rated the wine "Ruffino Greppone Mazzi, Brunello di Montalcino DOCG, Italy" the vintage 2008 on 11.01.2014 with 93 of 100 points. "Falstaff Magazin" has rated the wine "Ruffino Greppone Mazzi, Brunello di Montalcino DOCG, Italy" the vintage 2008 on 22.03.2013 with 87 of 100 points. "Wine Spectator" has rated the wine "Ruffino Greppone Mazzi, Brunello di Montalcino DOCG, Italy" the vintage 2007 on 28.02.2013 with 89 of 100 points. "Wine Enthusiast" has rated the wine "Ruffino Greppone Mazzi, Brunello di Montalcino DOCG, Italy" the vintage 2007 on 04.01.2013 with 89 of 100 points. "Wine Enthusiast" has rated the wine "Ruffino Greppone Mazzi, Brunello di Montalcino DOCG, Italy" the vintage 2006 on 05.01.2012 with 91 of 100 points. "Wine Spectator" has rated the wine "Ruffino Greppone Mazzi, Brunello di Montalcino DOCG, Italy" the vintage 2006 on 31.07.2011 with 93 of 100 points. "Wine Spectator" has rated the wine "Ruffino Greppone Mazzi, Brunello di Montalcino DOCG, Italy" the vintage 2005 on 31.10.2010 with 88 of 100 points. "Wine Spectator" has rated the wine "Ruffino Greppone Mazzi, Brunello di Montalcino DOCG, Italy" the vintage 2004 on 30.09.2009 with 91 of 100 points. "Wine Enthusiast" has rated the wine "Ruffino Greppone Mazzi, Brunello di Montalcino DOCG, Italy" the vintage 2004 on 06.01.2009 with 90 of 100 points. "Wine Enthusiast" has rated the wine "Ruffino Greppone Mazzi, Brunello di Montalcino DOCG, Italy" the vintage 2003 on 05.01.2009 with 88 of 100 points. "Wine Spectator" has rated the wine "Ruffino Greppone Mazzi, Brunello di Montalcino DOCG, Italy" the vintage 2003 on 31.05.2008 with 86 of 100 points. "Wine & Spirits Magazine" has rated the wine "Ruffino Greppone Mazzi, Brunello di Montalcino DOCG, Italy" the vintage 2001 on 01.04.2007 with 92 of 100 points. "Wine Enthusiast" has rated the wine "Ruffino Greppone Mazzi, Brunello di Montalcino DOCG, Italy" the vintage 2001 on 03.01.2007 with 91 of 100 points.